Here's why I'm not blogging this morning. 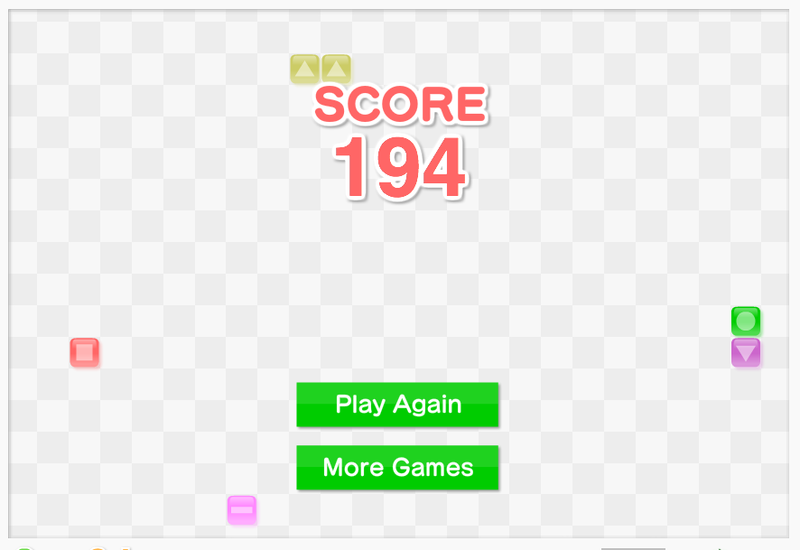 The image above is a just a screencap of my best score. The game is here. Like all the great flash games found by Miss Cellania and posted at Neatorama, this one has a very simple interface, only one rule, and wastes an inordinate amount of one's time. Please feel free to post your high scores in the Comments, and someone please let us know if there's a second level or if an improved version becomes available. You can read his strategy suggestions in the Comments. And a 146 now. Initially the hardest thing for me was to overcome the tendency to be distracted by the grey checkerboard tiles, which can look like they are blocking a pathway. Still working on an optimal "search" pattern. 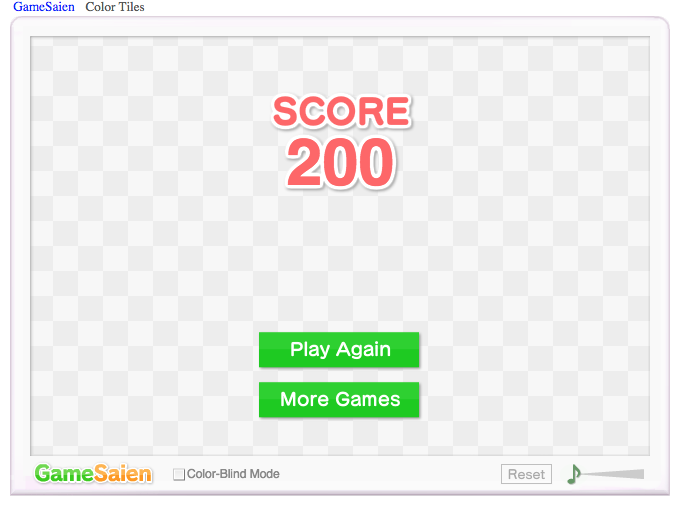 164 now, and I agree that the colorblind option seems marginally better to use. And now 180. It's quite clear that the more valuable time you waste on the game, the better you get at it. Finally a 190 with time left and no clickable moves. Now I have this monkey off my back and won't play again until an improved version becomes available. I have (sadly) continued to play, finally getting the 194 above that had no further possible moves. This has to be a logical ending point. FWIW, I think the anonymous comment below about starting in the center is probably correct. I have tried various strategies, including trying to shave the outsides first, but I believe working from the center out works out better. I don't think I cold prove it mathematically, but the matching possibilities seem to be better with a wide open center rather then the last ones being clustered in the center. Just got 164 using Anonymous' method. Whoo, 186. Looks like 200 is the max possible score. Got to 189 and couldn't make any more moves. The game doesn't seem to sense that; the timer kept going. Presumably it's set up with pairs of matching tiles, but as you know, sometimes a click removes three. Hit 195 yesterday. I think I need to stop now. I agree. I'd like to see a "strategy" mode where you don't have to worry about time. Great post! I found it easier to turn it on color-blind mode. The shapes as well as the colors help me make matches faster. Guess what, gang? I got 12! Aren't I brilliant? Do you think I got the all-time lowest score ever? Maybe I'll read the instructions and your suggestions and try again. Well, I tried it again. And I got a glorious 6! Wahoo! If I keep trying, do you think I could eventually get a score of 1? Oh no, not again. You already got me hooked on 2048 until I beat it. I don't know if I have enough free time right now to risk trying this game. > Do you think I got the all-time lowest score ever? p.s. i don't like the only 120 seconds to play limit. Noooo! Just when I've overcome my Luxor: Amun Rising addiction! Dominique sent a screencap of the 198 score with two non-matching tiles left. To beat the game, a strategy : first step : start by going fast, using your peripheral vision, and train yourself to avoid missclicks. You'll get to 180-190 easily. But you'll get stuck by solo tiles left by triple matches. As soon as you get to 190 with 20-25 seconds left, you have to train again, this time to avoid triple matches. I start with a corner, usually the bottom-left one, then I go up, I do part of the top, and clean the rest of the board diagonally. This way, as you don't have tiles on your left and on the upper side, you don't risk any triple click, and can match fairly quickly (the diagonal is probably optimal if it's the one of the square inscribed inside the rectangle of the board). Then, when you get to ~170, you have to change your strategy, looking for pairs of adjacent tiles... Which can be really annoying ! Quit the diagonal, attack on the right of the pack, dare to match inside. Beat it. Too bad the game doesn't seem to be still developed. One could imagine lots of improvements ! Excellent, RolandT. I've placed your screencap on the post as an addendum. However, this is a time thief and I'm not going to try to improve on that. I'm not, I'm just not. The game is also available as a phone app. On the phone app, when the timed game ends, you get the option to play onward in attempt of getting the perfect score. That might be the un-timed option that Anonymous wanted.